Ouya Outsells Xbox One. No, You Read That Right! ……………………Well…..Microsoft…I think its time that you really start fixing those last few issues with the Xbox One. Recently, Cinemablend released an article showing how the PS4 is currently destroying the Xbox One in preorders in several different countries. This includes, America, Canada, France, and Germany. Now, naturally in certain countries where the Xbox One was seen to be a security and privacy threat, it was understandable that the PS4 has more preorders. In fact, with everything that’s happened so far, its only natural for the PS4 to have more preorders than the Xbox One. The damage done to the Xbox One’s image is going to take quite a while to repair, if its even possible at all. But what really gets me in Cinemablend’s article, is that in Canada, THE OUYA IS OUTSELLING THE XBOX ONE. That’s right, THE OUYA. Now, this “android gaming console” didn’t even blip on my gaming radar, so to see it currently killing the Xbox One in Canada is just maniacal. Now, the Ouya has been deemed as a lukewarm device, which is understandable considering its a smart phone turned home console. 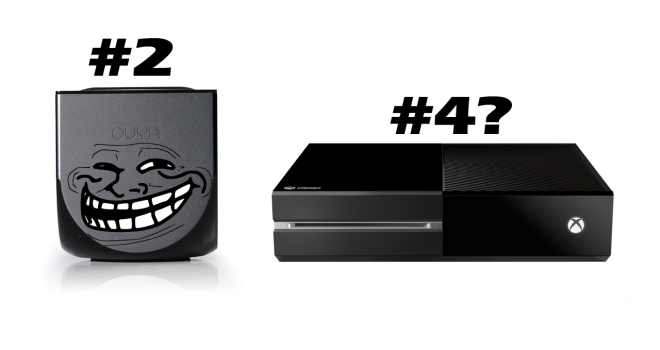 But have you any idea how SMALL the preorders would have to be in order for the Ouya to pass the Xbox One? I’m sure Microsoft will be in full damage control mode soon, and this is why they have LIMITED preorders available for the Xbox One, to give the illusion of demand. They’ll pull their “ALL SOLD OUT” card, but not give any sales figures. I’ll bet money on it. You are stupid to think that a sub par android even competes with a gaming console. You could have made an article saying that Sudoku games are KILLING XbOne and it would be just as valid.